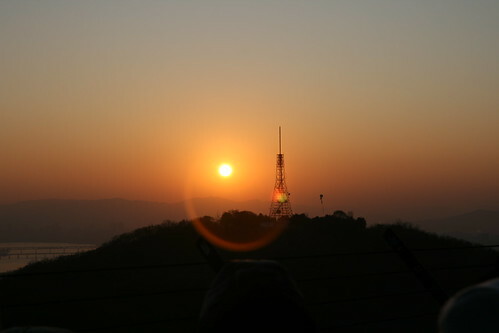 6.00 am on New Year's day, a saner person would have stayed in bed for at least another three hours, but Euna and I braved the vomit strewn streets of Itaewon and made our way up to the top of Namsan mountain to see the sunrise. 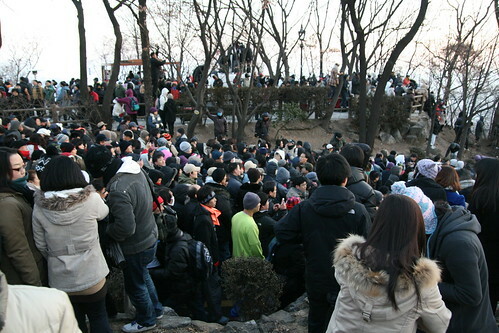 Unfortunately it seemed that half the residents of Seoul had decided on the same course of action. 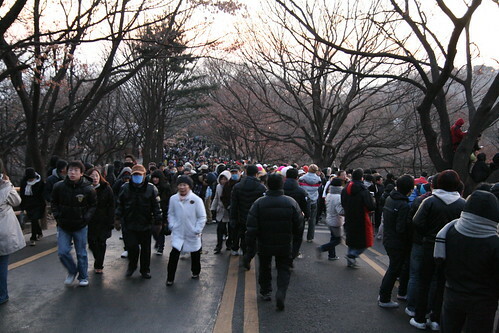 Wading through the hordes of visitors we headed to the base of the tower; squeezing our way past thousands, nay millions of families, elderly couples and drunken twenty-somethings in high heels and trendy suits. 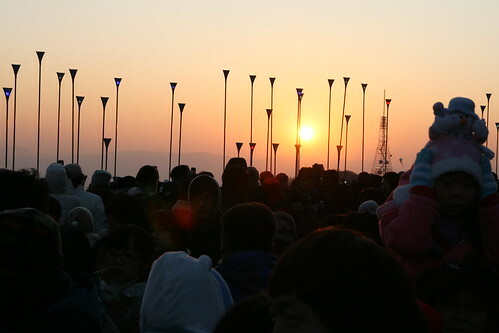 We came for the sunrise, but we stayed for the bizarre sight of thousands of Seoulites worshipping the sun. 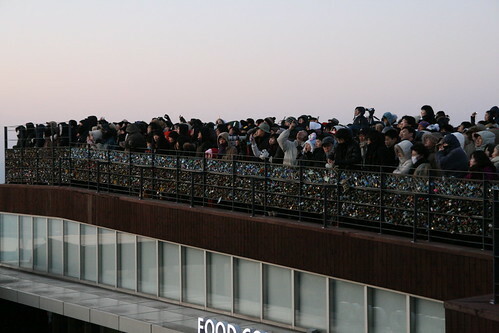 There were no bloody sacrifices, just a lot of pushing and jostling as everyone tried to get their camera-phones in the perfect position to capture the sun. 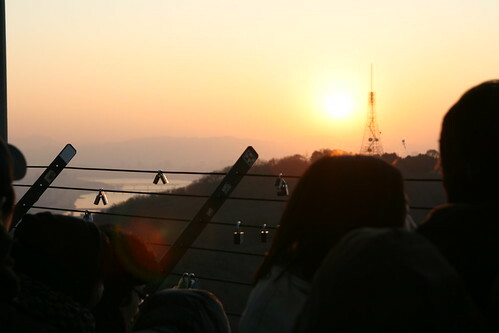 Walking through the crowds our nostrils were assaulted with the stench of soju and happiness and when the sun poked it's head over the horizon there was a real sense of celebration; a joyous moment shared between the multitude on top of the mountain. 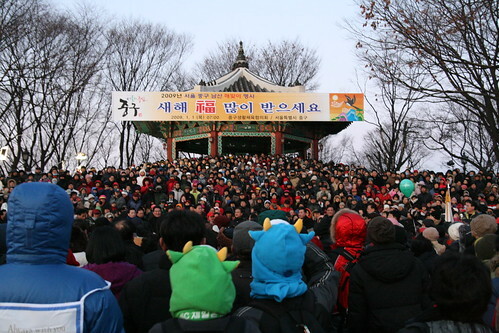 Half were early risers starting the New Year with a bang, the other half finishing off their New Year's Eve and stumbling around in inappropriate footwear. 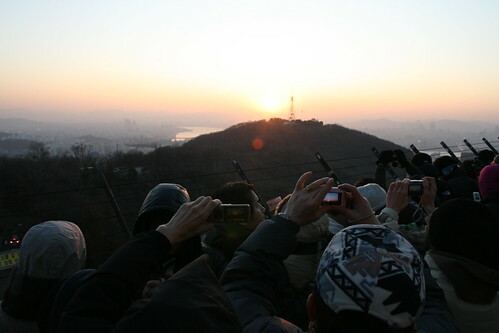 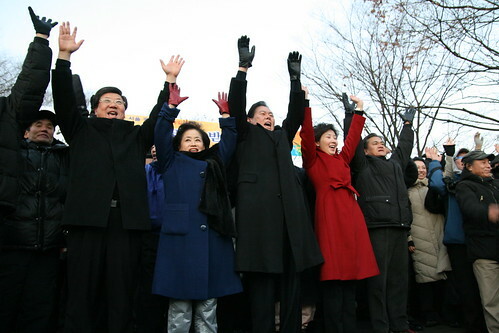 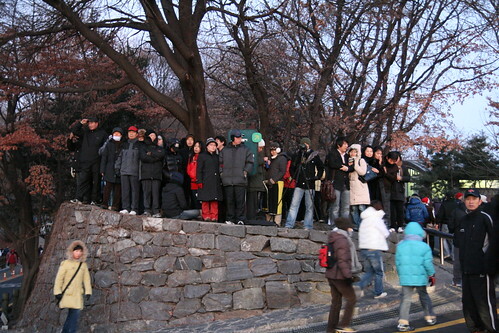 All of us were glad to see the sun rise on 2009.